Remember the post about my Spinning Competition at the Farm? I ended that post with a strategy to win . . . something my competitor couldn't match . . . adding color. I planned to weave an autumn shawl with handspun yarns and inlaid multi-colored leaves. Well, guess what? It worked!!!! This past weekend I won two blue ribbons at the Southeastern Animal Fiber Fair (SAFF) in Asheville, NC. Not only did I win in the category of 'Woven Wearable Item Using Handspun Yarn' (my shawl), but I also won a first place for my Swedish Art Weave bag! 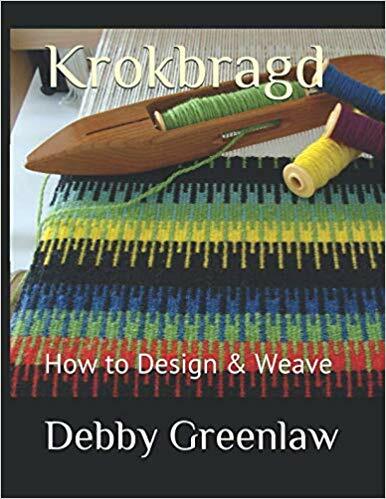 So, in this post, I thought I'd share the technique of weaving the inlay pattern that I used on my shawl. An inlay is essentially a picture woven into the cloth by "coloring" in a design with yarn or other decorative material. This is accomplished by using extra weft picks that are held in place by a plain (tabby) weave ground cloth. The basic fabric of a handwoven transparency is a sheer but stable plain weave. Transparency - a decorative fabric woven of thin, widely spaced yarns which form a sheer background for inlaid pattern. Pick - a single passage of the weft thread either over or under the warp. Plain Weave - the most basic of weave structures in which the thread goes over one, under one, over one, under one, etc. The warp , plain weave (tabby) weft, and border/selvedge inlays were handspun Romney wool that I talked about in this post. I used 884 yards (11.5 ounces) of 2-ply lace weight yarn. Since the woven fabric would be fulled during finishing, the yarn was not washed before I wove with it. For the colorful autumn leaves, I spun four bobbins of singles from Falkland wool roving and then plied these together. I used 29 yards (0.5 ounces) of the multi-colored 4 ply handspun. For the inlays, I downloaded three different leaf outlines from the internet and then enlarged them to the size I wanted. I printed each out on regular printer paper. In weaving terms, these patterns are called "cartoons". The cartoon is pinned underneath the fabric to provide a guide for weaving the inlay pattern. I used T-pins to attach it below the fell line so that the beater was free to place the weft. I moved the cartoons around, randomly varying the leaf type and orientation. I wove each inlay leaf with the 4-ply multi-colored yarn, working with about a yard of length at a time. Sometimes, depending on the leaf and its orientation, several strands of yarn were needed to cover separate areas of the the inlay pattern. Once the areas merged again, the strands were overlapped. In the finishing process, I wove in those strand ends with a tapestry needle. Since a shawl is two-sided and this particular shawl is relatively transparent, you don't want yarn strands carried across the design(s). That said, the weave will have a more textured side, where the inlays turn, and a smoother side or the "right" side. I was pleased there was only a relatively subtle difference in my sides. Fell - the horizontal edge of the fabric where the last pick has been placed. This is a very open weave with a sett of six ends per inch. In order to maintain the openness of the ground, I placed rather than beat the weft, maintaining a grid-like appearance. To strengthen the edges of the shawl, an inlay of the Romney yarn was woven for three picks at the beginning and end, as well as the three warp threads on either side. Sett - the spacing of the warp threads expressed as the number of ends (threads) per inch. Beat - press the weft into position. Ground - foundation weave; background around the pattern. When the woven cloth was taken off the loom, the warp and weft threads moved around a bit. To stabilize the cloth, it must be fulled, a process that locks the fibers together. I placed the shawl in my washing machine and soaked it in hot water with the addition of a bit of Dawn dish detergent. After soaking about 10 minutes, I set the washer to intermittent, extra slow agitate. It took roughly 20 minutes for the fabric to full. I rinsed the fabric, rolled it in a towel to remove excess water and hung it to dry. The finished shawl is 26" wide by 81 1/2" in length with 6 3/4" of twisted fringe on each end; plenty of soft woolen warmth to cuddle around me as the Autumn weather grows chilly. So, I may not have beat that farm competitor at tensile strength or speed to completion, but I think I matched him in utility of finished product, was close in intricacy of design, but hands down I triumphed on color!